University of the Philippines (UP) Doctor Francisco Tranquilino schooled the ”Liberal nincompoops” on the topic of human rights, the very concept they pit against Duterte. In Imperialism, Tranquilino a staunch defender of President Duterte explains, human rights take on a different context because they are defined by the powerful and elite which limits and subjects human lives to the whims of the few who rule. “Human rights were formed from Liberalism (1). The concept advocated by the Liberals as with the rest of the developed western world is that all individuals have equal rights and those promoting it must be respected,” Tranquilino explained. 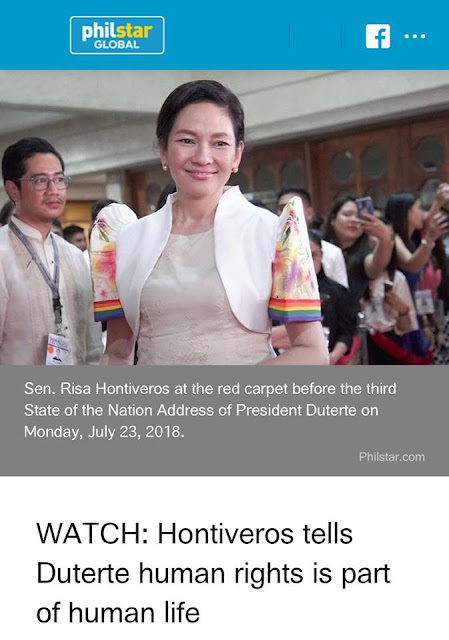 “However, fundamental flaws and inconsistencies exist, allowing only those with power to determine which rights must be safeguarded, using their own standards and moral compass in affording legitimacy to their actions,” he furthered. Tranquilino explains that for human rights to work, it should be redefined by the people, and not merely refer to the standards created and defined by the few people in power. 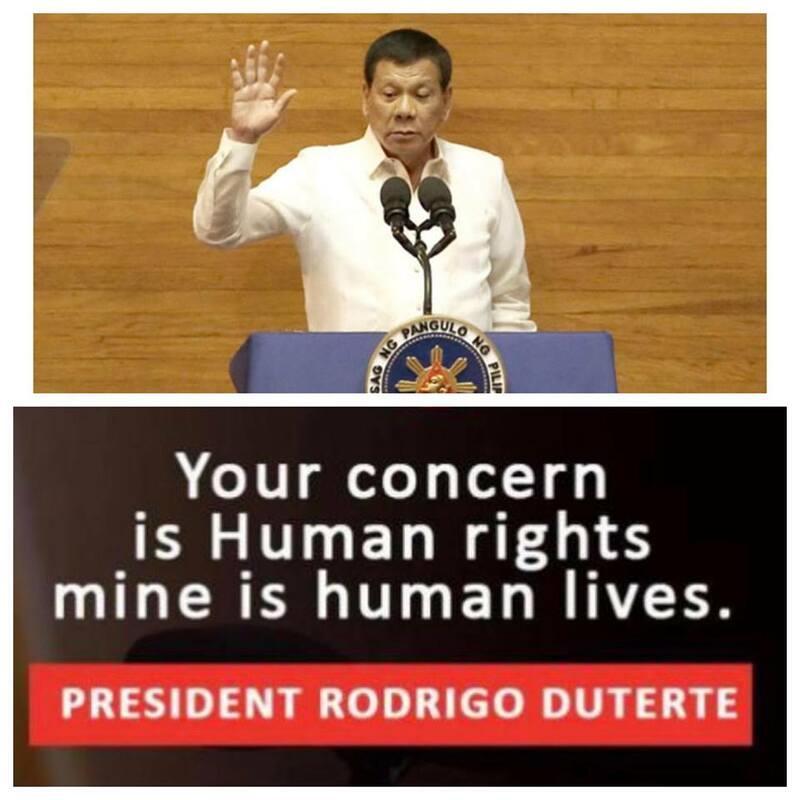 By raising concern for human lives instead of human rights, Duterte refocused on creating a better nation for everyone in a way where everyone benefits instead of simply promoting narrowly defined and selected “human rights”. “The stand taken by President Duterte with respect to human rights is a totally acceptable, practical approach (practical conception), with utmost consideration and response to the changing needs of his people. 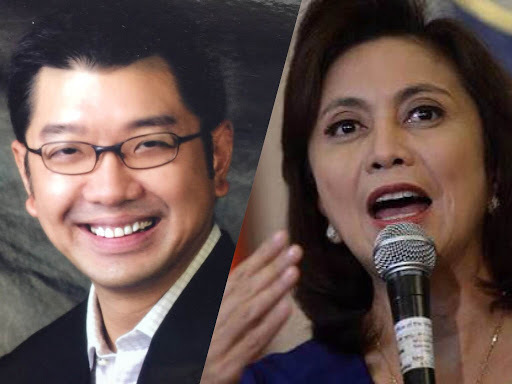 While Robredo takes on the Liberal’s elitist, essentialist conception devoid of any attempt to heed the people’s desires,” Tranquilino wrote in his post. In these times, President Duterte called for genuine change by being inclusive of everyone’s concern instead of exercising power from an exclusively elitist vantage point. Most people are aware of human rights and know the importance of maintaining them. However, people remain ignorant regarding the debates surrounding the implementation of human rights for imperialism (1). And Robredo is one of them! Imperialism is a policy of extending control or authority over foreign entities as a means of acquisition and/or maintenance of empires, either through direct territorial conquest or through indirect methods of exerting control on the politics and/or economy of other countries. And so “human rights imperialism” is an attempt to maintain or extend control or authority under the banner of human rights. Bilawal Atwal believes that the terminology of human rights has given the concept normative weight, from both the mainstream and throughout international relations. The argument for this form of imperialism is that the states that promote it, or have the greatest spheres of influences, can use this normative weight to accomplish national interests under the banner of human rights. The concept of human rights is being abused by some states or groups in order to exert their influence on a sovereign nation as a cornerstone of their foreign-policy interaction to eventually achieve their own interests. The powerful and influential entities are the ones who ultimately define human rights and what constitutes its violation. This therefore becomes an ethical dilemma. Human rights were formed from Liberalism (1). The concept advocated by the Liberals as with the rest of the developed western world is that all individuals have equal rights and those promoting it must be respected. However, fundamental flaws and inconsistencies exist, allowing only those with power to determine which rights must be safeguarded, using their own standards and moral compass in affording legitimacy to their actions. This concept of human rights enforced by the west took its prominence in the post-Cold War era, with varying forms and justifications but ultimately depend on the same argument that human rights are more important than the sovereignty of states (2). This clearly presents a problem, powerful states imposing their moral standards on weaker ones, double standards, insistence on only political and civil rights and disregard for economic and social rights. This Liberal intervention under the guise of protecting human rights misses other important conditions in a sovereign state that the interventionist is allegedly trying to “protect.” It disregards the people in a developing country. Again, as Stephen Kinzer noted, “the problem seems to be the narrow egocentric definition of what human rights are. Human rights need to be considered in a political concept. The question should not be whether a particular leader or regime violates western-conceived standards of human rights. Instead, it should be whether a leader or regime, in totality, is making life better or worse for ordinary people (3). b. Legal conception. Rights are understood as legal rights that persons have in virtue of positive enactments by legitimate governing bodies. The legal conception may be thought overly limiting as there are UN Human Rights Declarations that articulate rights but which are not currently legally binding through the international law. c. Practical conception. Conceives of human rights as shared norms about the obligation of states and other powerful social actors. These norms are responsive to the changing contexts of human life and are developed through an open discussion of shared values and concerns. For human rights to work, it should obtain legitimacy by involving the people and their aspirations. The concept must be redefined. The western-influenced, liberal-dictated, white supremacist, patriarchal, colonial-capitalist, intellectual elite-guided framework, replaced by bottom-up, participatory, people-centered, and demand-driven programs for the oppressed. The people’s demands for public services, the right to organize, the fight for a living wage, ending discriminatory hiring practices (5), protecting lives from the ill-effects of narcotics and related crimes, are some of the significant issues that should re-define human rights. 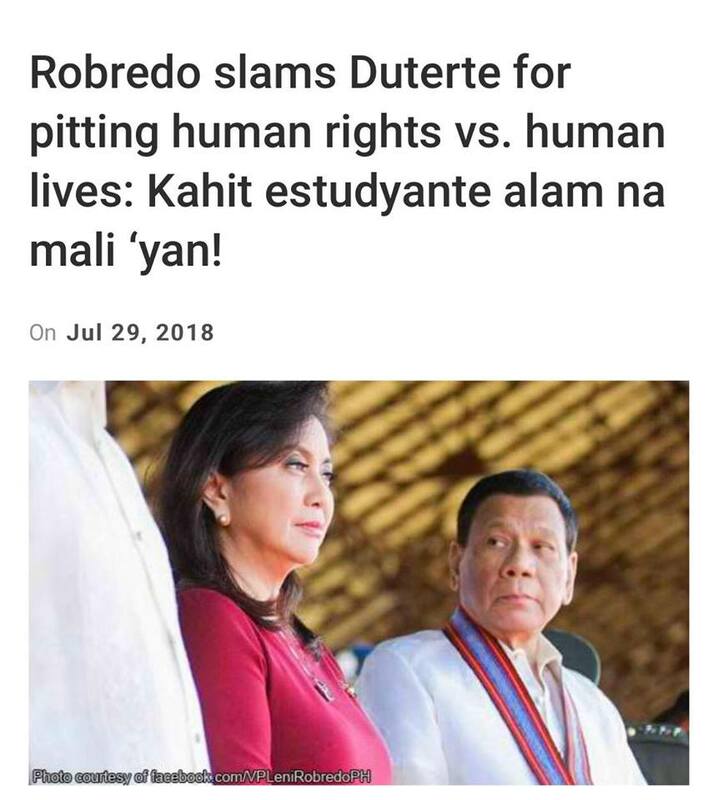 Using this same context, the comment by President Duterte: ”Your concern is human rights, mine is human lives,” highlights the contrasting points of view of a realist perception versus a purist liberal interpretation of human rights. 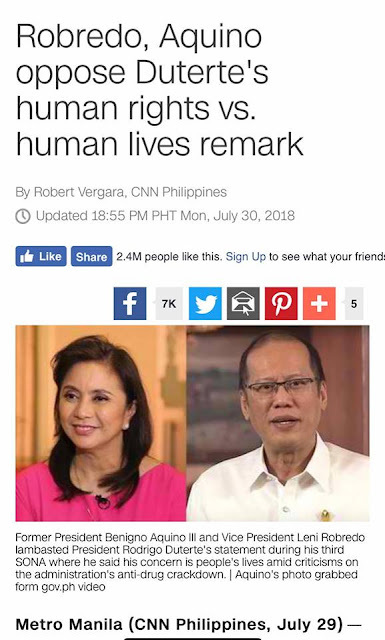 But clearly, the comparison is not a misleading and false dichotomy as claimed by Robredo and the other Liberal simpletons. Attitudes toward certain human rights are socially and culturally specific (6). And people in different countries may have different views about what human right policies would be most appropriate for achieving their desired conditions of living, for achieving peace and order or economic growth. Kinzer’s perspective is that in special situations, the aspirations of humans vary, some rights can supersede and ignore others considered less important (8). And any attempt to impose western-conceived moral standards to classify a style of rule as unacceptable would easily be seen as imperialism. The stand taken by President Duterte with respect to human rights is a totally acceptable, practical approach (practical conception), with utmost consideration and response to the changing needs of his people. 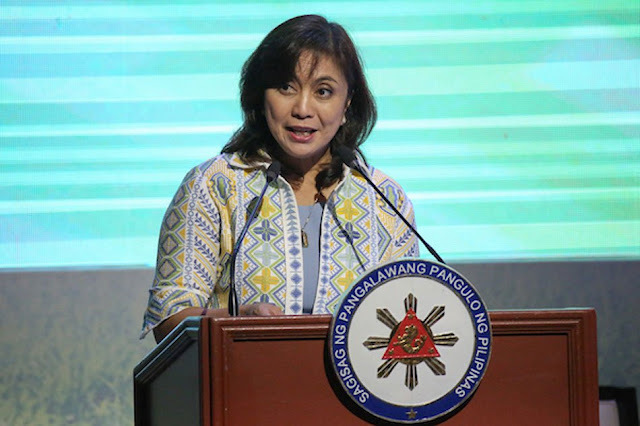 While Robredo takes on the Liberal’s elitist, essentialist conception devoid of any attempt to heed the people’s desires. 1. B Atwal. Are Human Rights Dominated by Imperialism? catch21.co.uk. 5. A Baraka. The Human Rights Project: Determined by the Needs of the Powerful. fpif.org.